While the company did not produce dolls itself, it was well-known in the doll industry for it's high quality clothing and accessories created especially for Top-of-the-Line composition dolls of the day. 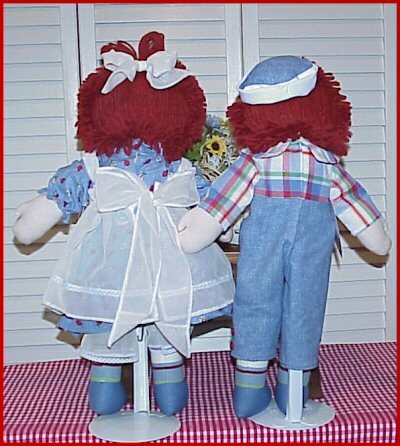 They were also known for their exclusive doll costumes created identically to those worn by child movie stars,(e.g. Shirley Temple), in the popular movies of day. 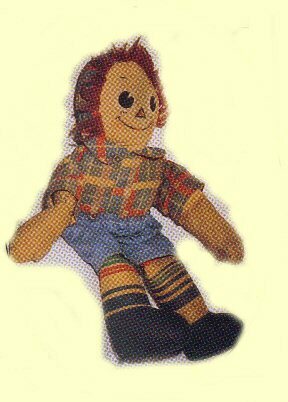 In late 1934, Mollye decided to add cloth dolls to her product line, and she started with the already well-known Raggedy Ann & Andy dolls, because she was aware that Volland would no longer be producing them, and the retailers would be looking for a new source for the dolls. 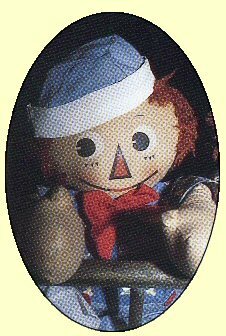 Johnny Gruelle had authorized The Exposition Doll & Toy Mfg. 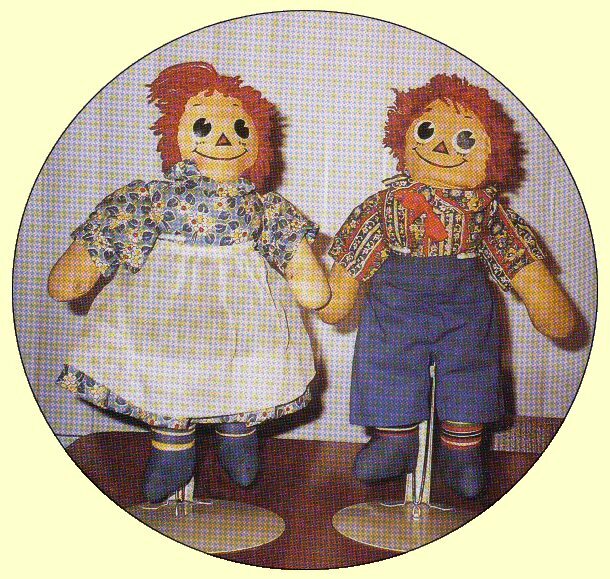 company to create the dolls, when Paul Volland died unexpectedly. Mollye knew that her company was more well-known than Exposition, and she used her influence with the retailers to put her dolls in their stores, rather than Expositions. A lawsuit with Gruelle resulted and when it was settled in Gruelle's favor in December of 1937, production was halted. 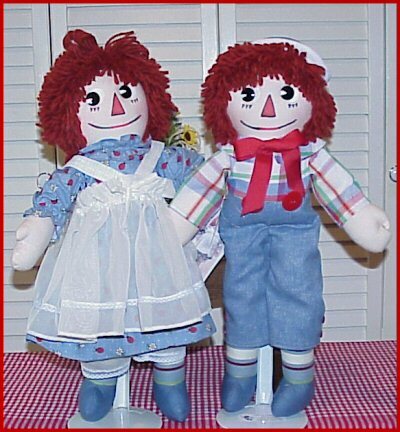 Mollye claimed to have added Beloved Belindy to her line of Raggedy dolls as well, however, only a proto-type has been documented. Mollye was a gifted designer, and many of her innovative ideas for her unique style of Raggedies, are still being used by today's manufactures of Raggedies. 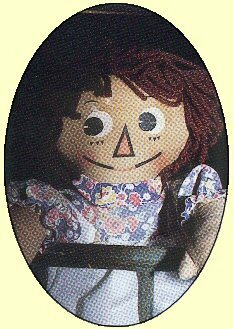 Her design is responsible for the construction of their "wigs" that are still used today, and for the painted heart on Ann and Andy's chest. Volland's Ann first had a candy and later a wooden heart, which could be felt beneath the cloth. But Andy was never given one. Molly-'Es Raggedies are easily recognized by their distinctive look. 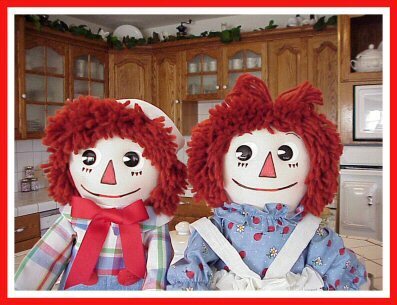 Ann & Andy have identical bodies including Ann's top-knotted-straight back Auburn wool wig. Only their clothing set them apart. 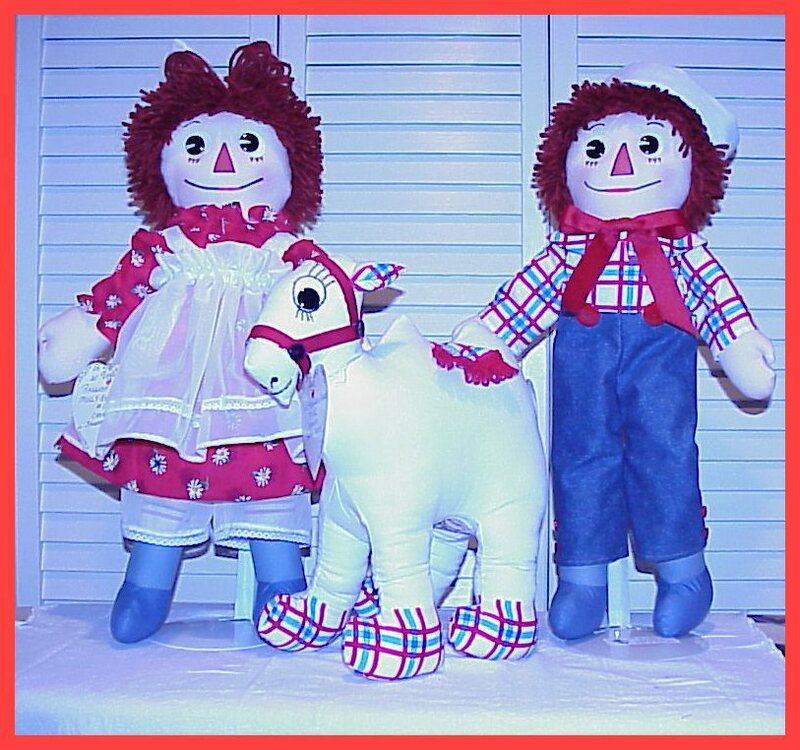 Molly-'Es had blue shoes that also served as feet and were not removeable, their toes pointed forward, unlike Volland's side-facing style, and their stockings were multi-colored stripes, rather than the traditional red/white stripe shown in Gruelle's storybook illustrations and carried over to the Volland and Exposition dolls. 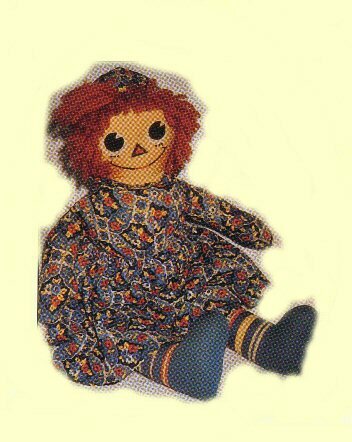 In keeping with her reputation for high quality doll clothes, Mollye selected only the finest fabrics for her Raggedies. Their bodies were made of a soft peach colored (flesh-toned) cotton fabric. Their hands were mitt shaped with slightly exaggerated thumbs. Most had jointed elbows and knees. The most common facial features had silk-screened eyes, with a notched black pupil glancing to the right, printed over a circle of white,fine eyebrows, 3 triagular shaped eyelashes, long black-outlined nose. A bold black-line smile with a red center for the mouth. 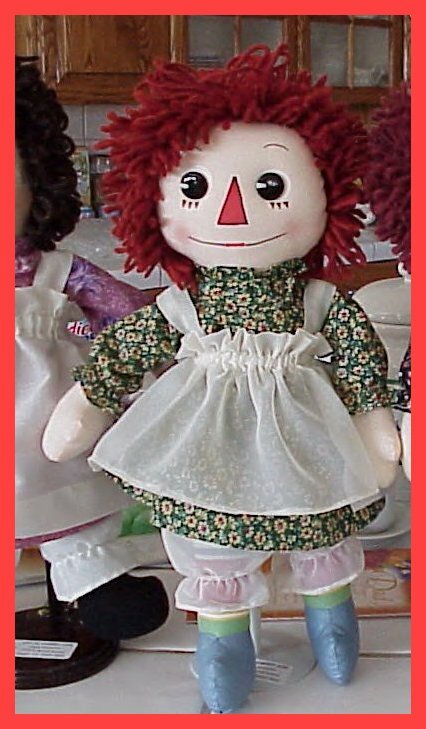 Manufactured by Molly-'Es Doll Outfitters"
attached to a fitted bodice with a full skirt. over the chin of the doll. two white buttons at the neck and the waist. where they were tied into a beautiful bow. and had white trim at the bottoms. one-piece suit, and unlike the Volland, were removeable. but it actually closed in the back with two buttons. ...ending just below the knee. with a RED Satin ribbon bow-tie sewn at the neck. Ann's dress or Andy's shirt. and the face. Ann had a slightly longer lock at the top. 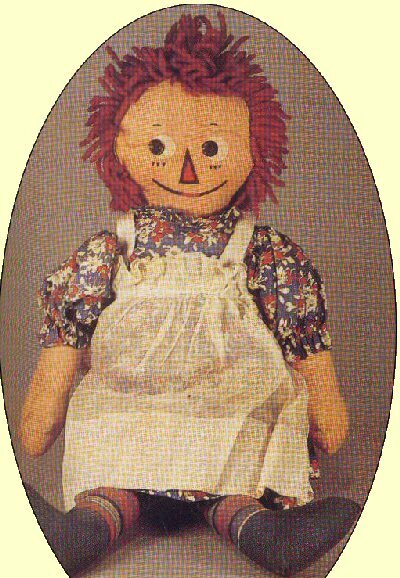 The doll's clothing formed the bodies, and only Ann's skirt, organdy pinafore and undies......and Andy's pants were removeable . the seam where the arm attached to the torso. Ann wore an attached ruffled collar and matching elastic-waist skirt. red bow tie, and a band down the center-front. 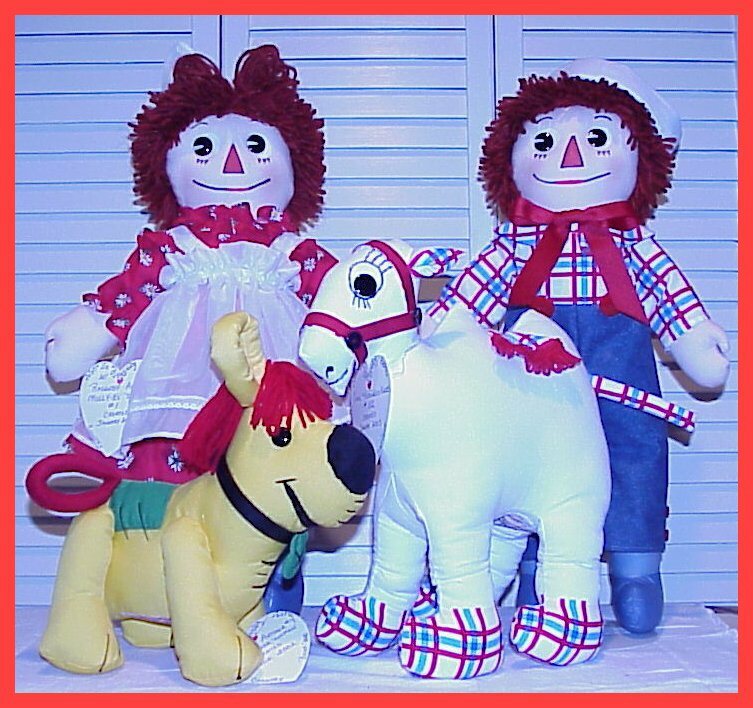 To Learn more about ALL of the Raggedy Characters........Click on their Link in the left-hand column.